When the Mount Auburn Cemetery was founded, in 1831, it revolutionized the way Americans mourned the dead by offering a peaceful space for contemplation. This cemetery, located not far from Harvard University, was also a place that reflected and instilled an imperative to preserve and protect nature in a rapidly industrializing culture—lessons that would influence the creation of Central Park, the cemetery at Gettysburg, and the National Parks system. Even today this urban wildlife habitat and nationally recognized hotspot for migratory songbirds continues to connect visitors with nature and serves as a model for sustainable landscape practices. Beyond Mount Auburn’s prescient focus on conservation, it also reflects the impact of Transcendentalism and the progressive spirit in American life seen in advances in science, art, and religion and in social reform movements. 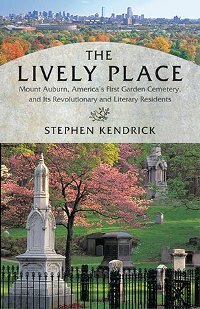 In The Lively Place, Stephen Kendrick celebrates this vital piece of our nation’s history, as he tells the story of Mount Auburn’s founding, its legacy, and the many influential Americans interred there, from religious leaders to abolitionists, poets, and reformers.